Gaeta, Castelnuovo al Volturno and Chieti. Busy week for Fontevecchia. After the celebrations in honor ofSan Biagio last February 4, members are engaged in a triple appointment. 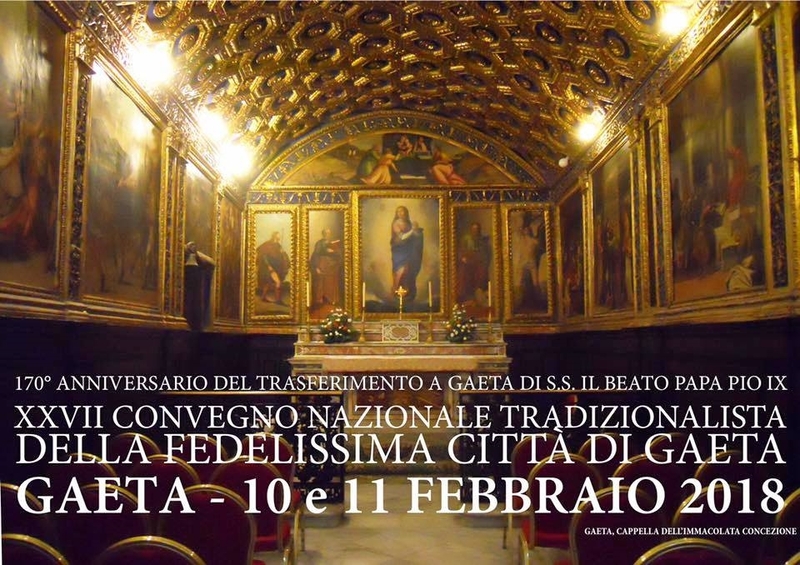 Saturday, February 10 Gaeta for the XXII Meeting Traditionalist which this year is dedicated to 170 ° anniversaryarrival of Pius IX from Rome to Gaeta and 140 years after his death. "E 'on the night of 24 November 1848. The sovereign pontiff, the Blessed Pius IXHe flees from Rome. Coupling in Ariccia, in the town square where there is the CollegiateSanta Maria Assunta, Awaits a woman with an 'other carriage; is Teresa von Spaur Countess, wife of the Bavaria, the CountKarl von Spaur, Which in practice organized the Pope's escape. The pope again, with the countess that instructs the driver to proceed towardsGaeta, in Kingdom of the Two SiciliesTo continue from there by sea in a location yet to be determined. Meanwhile Cardinal Antonelli precedes him in Gaeta, where theKing Ferdinand II of Bourbonthe next arrival of the pontiff. After four hours the group is in the vicinity of Gaeta; Pope falls to Caposele Villa Mola, welcomed by Cardinal Antonelli. Here Blessed Pius IX wrote a letter to King Ferdinand asking for hospitality; the letter is brought to the king by Count von Spaur. On the evening of November 25, the group arrives in Gaeta and here he settled in some of the rooms' hotel the Pergolella. The king, upon receipt of the letter, it rushes to Gaeta, helped by Cardinal Antonelli, Pius IX persuaded not to continue the journey but to stay in that city and the Pope is happy to comply. And it was during this visit that the Pope, according to tradition enlightened byHoly Spirit, He decides to write the 'When the first enciclica which he interrogates the Catholic bishops on opportunities to proclaim the dogma of 'Immaculate Conception, An event that will be realized on his return to Rome with Between the decision of the Mass 8 December 1854". 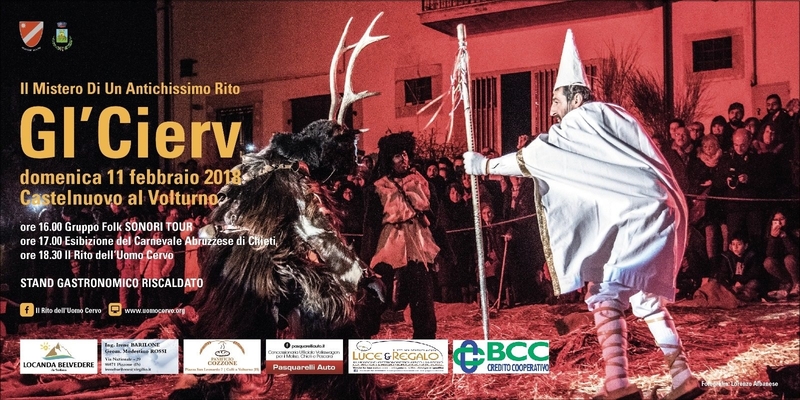 Sunday, February 11 It will be Castelnuovo al Volturno, With their PulcinellaFor the event Gl’ Cierv - The man deer myth. 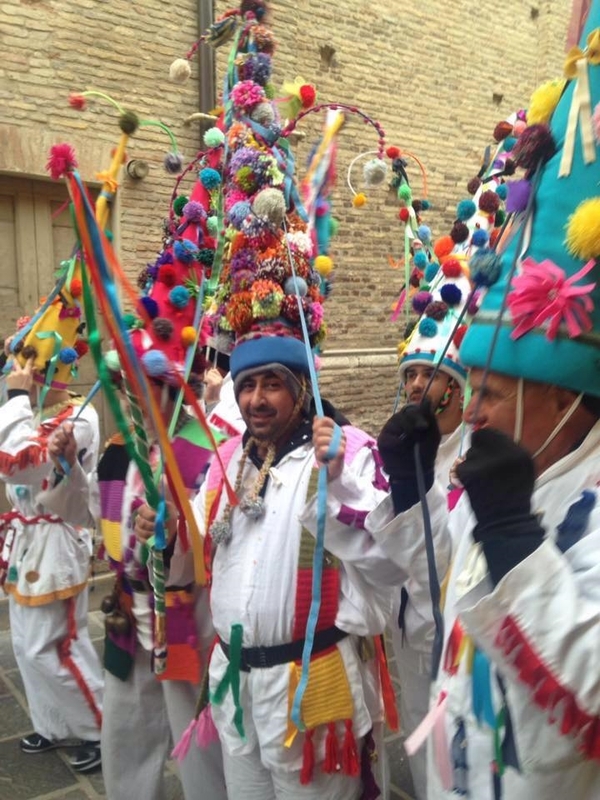 A very ancient and mysterious ritualanticipates the celebration of the carnival and that will see the performance of groups including the Company of Pulcinella Fontevecchia of that, for the occasion, were invited to participate by walking Together, Chieti association with which Fontevecchia collaborated for several years. Tuesday, 13 Finally, from 16, We are committed to Chieti, Departing from Piazza Garibaldi, the popular Carnival teatino, A now historic city event, along with other groups and associations. The event will unfold in a long carousel of color and music along the main streets with masks, wagons andPulcinella inevitablefrom the large conical hat. At the end of the parade,trial of King Carnival which then it will be burned.